My hand painted papers and an image of pear, familiar but never the same. Elena, there is something about this piece that keeps me coming back to look at it. 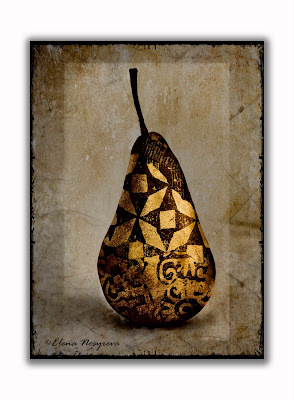 That pear is so 'Renaissance' - but the background isn't. It works! I am intrigued. That is what I like about photomontage - the result can be totally unexpected.